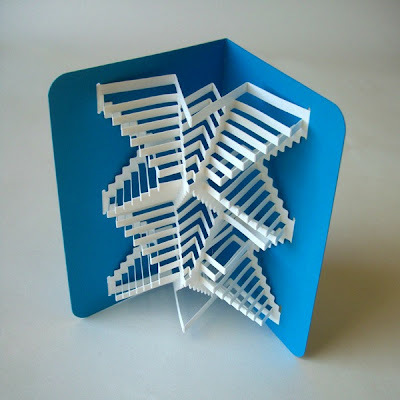 Facing facts here... my brain just doesn't work the same way as that of paper engineer, Elod Beregszaszi, but that doesn't mean I can't appreciate the incredibly complex cut and fold paper designs he loves to create. Elod explains that his interest in origamic techniques "was sparked by a trip to the London Japan Centre where I chanced on a pattern book by Masahiro Chatani. 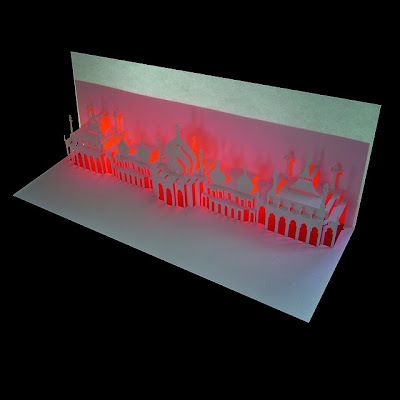 I was immediately hooked, and have been designing my own templates, both architectural and abstract, ever since." 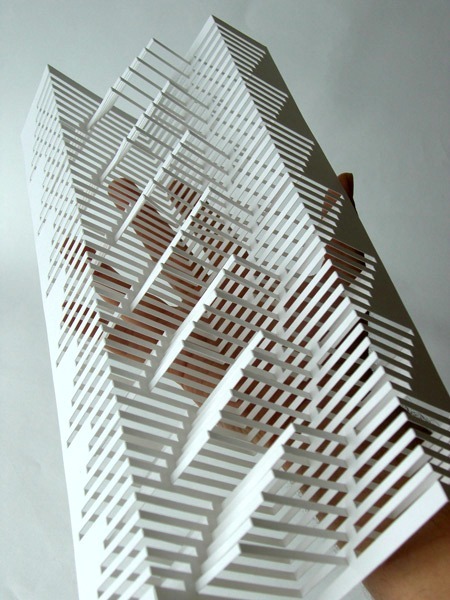 Many of his designs are cut and folded from a single sheet of paper and can be fully collapsed. 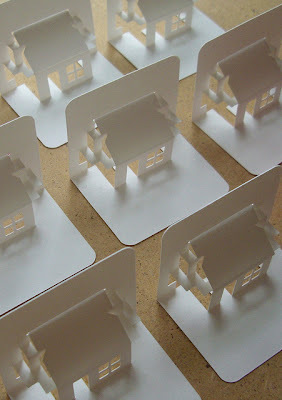 He founded POPUPology in 2006 as a commission-based design studio. Elod produces installations for art and design shows, and collaborates on projects such as window displays and folding paper products. 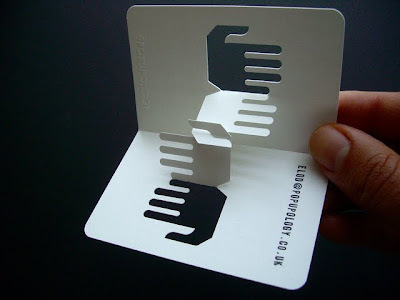 Just one example from his clever collection of business card designs; see many more on Flickr. And I love this unique wedding card too. Currently Elod is featuring a Paper Build Competition on Facebook. 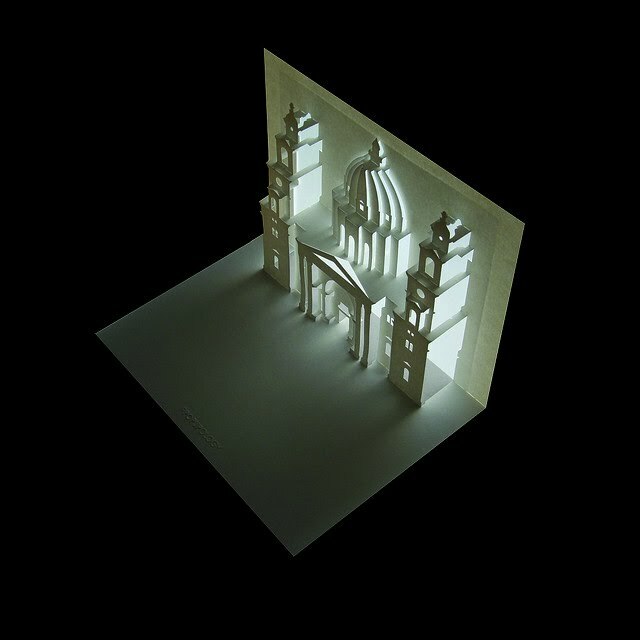 To enter, simply post a picture of your favorite building (front and side views) labelled "paper build" on his wall. 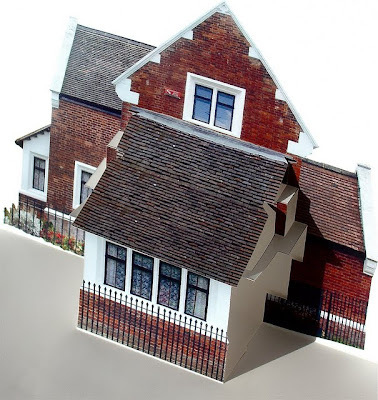 Every two weeks, Elod will select one building to transform into origamic architecture and will send a finished card featuring the design to the person who submitted the idea. How's that for a great way to own an original art piece?! If you'd like to try your hand at kiriorigami (cut-fold-paper), visit Elod's Paper Surgery page for his free templates and tutorials. He also has a new shop called, what else?... 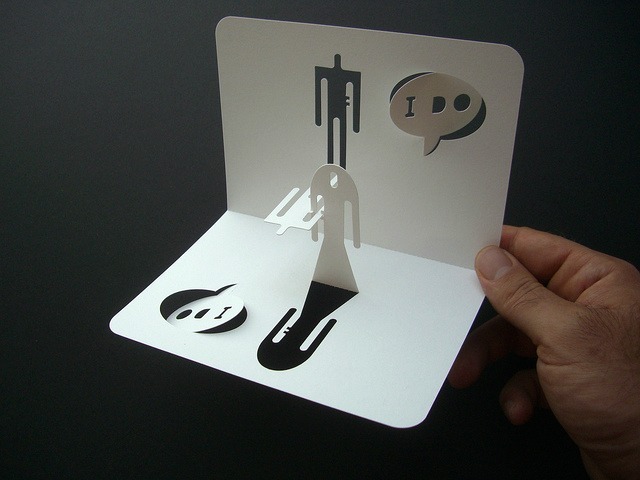 POPUPology where you can purchase his work, including a lovely Japanese Tea House card. Elod is donating all of the profits from the sale of the Tea House to those who were left homeless by the Japanese tsunami. How inspiring! I wish to try the heart from the tutorial , Thanks for the link Ann. Another jaw-dropping post! In awe of the complex pieces, but so charmed by the business card and wedding card. Thanks for sharing such amazing artists! Incredible- I wish my brain worked like that. what an inspiration this is a beautiful work of art! 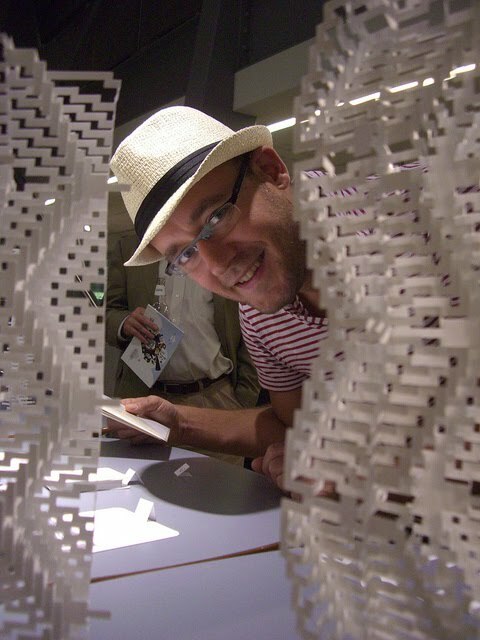 Every time you feature a paper artist, I get all weak in the knees! This is fantastic. my kids and I are oohing and aahing over Elod's work. He definitely has the gift of using both sides of the brain at once. Marvelous work. Oh my goodness! I love this stuff. The St. Stephen's Basilica is particularly beautiful. Wow. Totally amazed with this! Tks so much for sharing the work of artists like him! Wow, this man's work is amazing. I he must be one of the most detailed people I've ever met. Fabulous, absolutely fabulous. I love his work. woohoo -- I was wondering when you'd get around to featuring Elod! His work is amazing. I've been following his photos for years and am constantly amazed by the things he comes up with. These are the most creative pop up business cards I have ever seen!